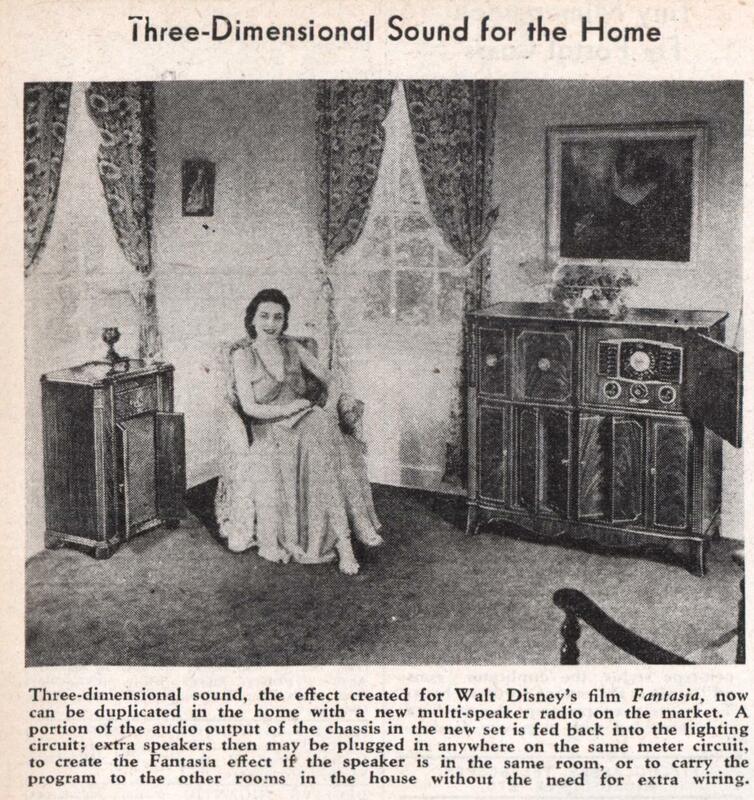 Three-dimensional sound, the effect created for Walt Disney’s film Fantasia, now can be duplicated in the home with a new multi-speaker radio on the market. A portion of the audio output of the chassis in the new set is fed back into the lighting circuit; extra speakers then may be plugged in anywhere on the same meter circuit, to create the Fantasia effect if the speaker is in the same room, or to carry the program to the other rooms in the house without the need for extra wiring. Oh no, this was just stereo. Apparently with the original release of Fantasia, Disney went to theaters and installed the special equipment for stereo reproduction, then pulled the equipment out and went to the next set of theaters. Of course, there would have been no stereo radio broadcasts at that point, so the buyers of this home set may have been disappointed to find out there is no stereo whatsoever being produced by it, just two speakers instead of one. Oh! How stupid of me!I forgot that everything was in mono back then. So this set-up allowed the speakers and amp to be connected to each other through the electric service outlets in the home? Like Ethernet over power? Very cool for it’s day! I do have to agree with that, especially given the size of the radios then having the possibility of sticking a second speaker elsewhere in the house would have been very cool. Even today there are setups where someone prefers to have remote speakers. Yep broadband over power. The only problem there is interference to other services, i.e., amateur radio. Microwave technologies will help in the future. Yes, it clearly wasn’t even stereo, since the radio broadcasts would not have had a second audio channel. Merely the effect of a second speaker would provide a small illusion of a stereo effect, it was hoped. 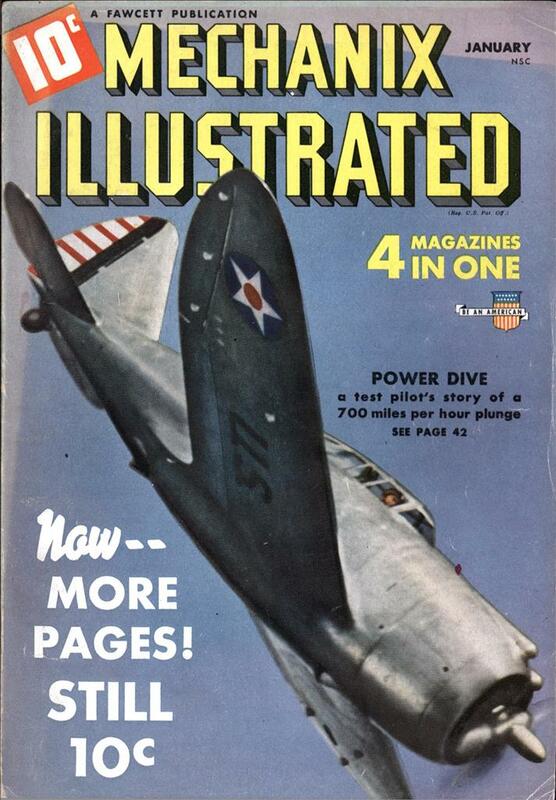 Sending a signal over the house power line is nothing new. We had a wireless intercom that plugged into the wall. This is when I was a kid in the late 50’s. This just sent an FM signal through the house wiring. They still sell these types of intercoms at places like Radio Shack. Wireless speakers can also work this way. These signals can mess up things like an X10 or Ethernet over house wiring. It does “dirty up” the power line. As long as there isn’t a power line transformer in between, it will even work between houses. That’s what the “House” code is for on the X10 system. I used to use that tubed intercom to talk to my friend across the street. Neato! GE had this system back in the 60s to allow owners to plug in a speaker anywhere in the house and get a mono feed from the console. Colleges also use to do it, although FM and now webcasting overtook that technology and well.